You are here: Home / Health / Care for long floppy ears! Care for long floppy ears! Long, floppy, big, soft, and droopy ears make Basset Hounds unique and lovable. But these unique ear flaps along with short and stumpy legs and his sniffy nature make situation warranted for constant management to avoid ear problems. Here’s how to take care of your Basset’s ears. 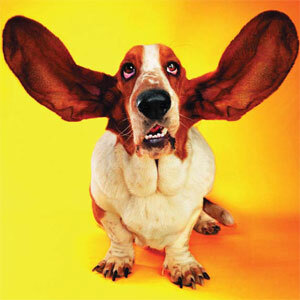 Basset Hound’s large pendant ears do not allow air to circulate inside the ears, hence, if the ears are not cleaned regularly, they can become a major source of bad odour due to a buildup of ear wax. This can cause irritation and develop into ear infections and a breeding ground for ear mites. The outside of the ear may have hair missing and feel warm to the touch if there has been a lot of rubbing and scratching. The inside of the ear may look red and irritated with fowl smelling brownish-black substance or greenish discharge. If you think that your Basset’s ears are possibly infected, it is advisable to take them to your vet for a diagnosis and treatment. Take care while your Basset Hound eats. Do not allow his ears to droop in food on a daily basis as they may develop chronic ear flaps skin diseases. Take extra care of puppies as they can trip over their long ears. Sometimes, puppies can even bite their ears if dipped in food and can cause infection. Hence it is necessary to keep a Basset’s ears out of the food bowl. This can be achieved by selecting a narrow bowl for feeding so that the ear flaps stay outside the food or hold them up on top of the head with a light elastic band while feeding. (Be careful, keeping the ear flaps in unnatural anatomical position for long time or in tight elastic tourniquet will lead to compromised blood supply and cause irreparable damage to ear flaps). Walking Basset Hounds with too long ears on irregular rough ground may damage the sweeping ear flap tips and attract external parasite infection like hookworm larvae, ticks and mites and may cause chronic and potentially fatal diseases. Taking Basset Hounds on smooth hygienic surface for regular walk and observing and cleaning the ear flaps after walking may prevent the conditions. Basset Hounds with comparatively smaller ears require constant attention and cleaning twice a week, while, those with much larger ears and the insides, require cleaning every two weeks. http://www.dogsandpupsmagazine.com/wp-content/uploads/2013/08/long-floppy-ears-2.jpg 134 250 Dogs and pups Magazine http://www.dogsandpupsmagazine.com/wp-content/uploads/2017/05/1254nal.jpg Dogs and pups Magazine2012-11-16 08:28:592017-04-11 23:56:41Care for long floppy ears! Meet our Karmic cousin... Flip! Flop! Floppy! Cute Hush Puppy dog! Pet parenting… First brush with love!